Google launched Android Wear 1.0 in year 2014, starting Android’s journey in the world of connected wristwear. After more than 2 years Google has finally launched the Android Wear 2.0 on February 8, 2017. With Android Watch 2.0, Google is trying to “Make the most of every minute.” The launch of the Watch OS was accompanied by two new watched that run Android Wear 2.0, LG Watch Style and LG Watch Sport. Both the watches are designed in collaboration with Google. This update tries to sharpen the Google’s vision for smartwatches, as they play catch-up with Apple’s watchOS 3. For example, the new version of watch OS allows Android users to make payment using Android Pay from an NFC-equipped watch, which works very similar to the Apple Pay. It is interesting to note here that Apple Pay has been present in watchOS since the very beginning of Apple Watch in 2015. Another catch-up is related to having independent apps in the watch. In previous version, Android would automatically install any Wear versions of an android app without giving any way to disable them. With Wear 2.0, users can customize the in-built watchfaces directly from the watch, and it also includes bigger pool of watchfaces to choose from than before. Colors, complications, backgrounds, and much more can be easily changed. Watchfaces can also display information and actions from user’s favorite apps. A simple glance at their wrist can allow users to check their next appointment, stock performance, progress on fitness goals, or whatever is important to them. The pre-installed fitness app on most Android Wear watches, Google Fit, now lets users to track their pace, distance, calories burned and heart rate as they Are walking, running or cycling. Users can also measure weight-lifting reps, in addition to push-ups, sit-ups and squats. With Android Wear 2.0, users can choose which apps they want on their watch and download them directly from the new on-watch Google Play Store. The watches with a cellular connection can be used to make calls and users can use the watch apps no matter where their phone is. Google has given users many new ways to use text in their watches. Users can reply to messages with your voice, which is easiest and most reasonable. Users can also use emoji, or Google’s canned responses. Along with that users can scribble letters one at a time on the screen, or use the 26-letter on-screen keyboard. 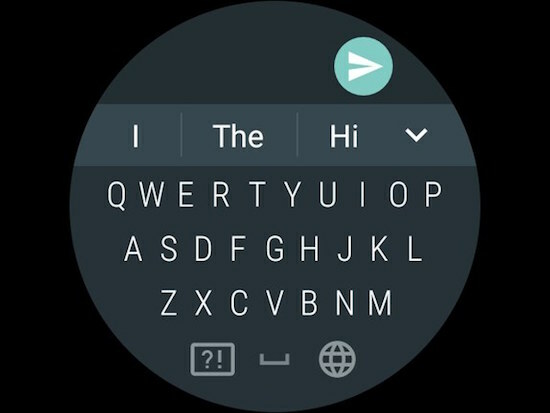 Yes 26-letter keyboard is now included with the Android Watch 2.0. Android Wear 2.0 brings the Google Assistant to user’s wrist. Now users can easily find answers and get things done—hands free. A lot of things can be done now easily, like asking Google Assistant about the weather or setting a reminder to bring an umbrella, Making a restaurant reservation or navigating to work. The Google Assistant is available in English and German on Android Wear and Google has promised to release it for other languages in the coming months. These were the Top 5 Best New Features included with Android Wear 2.0. We believe that with times developers will create great apps using the features which are released. Our developers are very excited to start creating apps using the new functionalities offered by Android Wear 2.0. Specially the apps for fitness and retail industry. Let us know your thoughts in comments below. More than 2 years after starting their Android Watch journey, Google has finally launched the Android Wear 2.0 on February 8, 2017. Let us take a look at Top 5 New Features that have been launched by Google in Android Wear 2.0.